14.12.2018 - 02.05.2019 From October to incl. 13 Dec. 2018 limited ski school and course programme in recduced-size children's area. We offer plenty of skiing fun in our colourful, sporty snow world right at the mountain station of the Gamsgarten gondola. 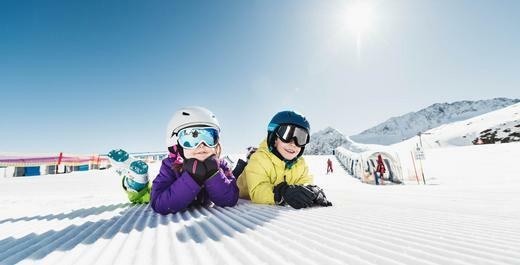 If you want to learn how to ski on the Stubai Glacier, supervised by others, you can attend the BIG Family Children’s and Youth’s Camp. If you head for the pistes together with mum, dad, grandma or granddad, there is a separate area in the BIG Family Kinderland around the magic carpet no. 1. Moreover, there are the BIG Family Slalom at the Kitzlift, the BIG Family Boardercross below the Murmelebahn lift, the line for children in the Stubai Zoo Snow Park in the winter and the BIG Family Fun Slope on the Eisjochferner. If you like it to get fast, then you will love the piste with time-taking (uphill from the Murmelebahn) or the race track with time-taking on the Eisjochferner. If you need a break from skiing in Austria, you can take a seat on a rubber tyre of the snow-carousel and enjoy some rounds. Come and get to know B.Big and Mini B.! The Miniland, a part of the Kinderland (the magic carpets 2, 3 and 4) as well as the BIG Family Children’s Restaurant belong to the BIG Family Ski-Camp. 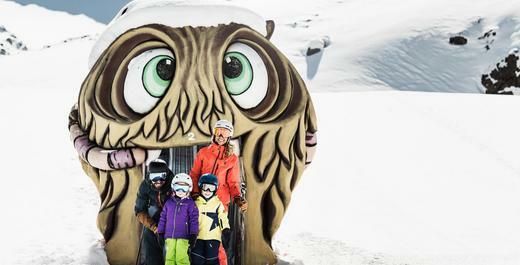 Registration for the BIG Family Ski Camp takes place in the office of the Neustift ski school on the Stubai Glacier (right where you get out of the gondola at the Gamsgarten mountain station). Our ski school partner at the BIG Family Kids Land. Awarded with the "Quality Award" by Snowsports Tirol. Only the best Tyrolean ski schools receive the "Quality Award - Snowsport Tirol". They must pass a strict control and score points for high quality.